Bank House is a 17th century Grade II existed building located on the Whitchchurch Road in the pretty harbour village of Solva, near St Davids. There are pubs, restaurants, tea rooms and quaint little shops to enjoy during your stay. 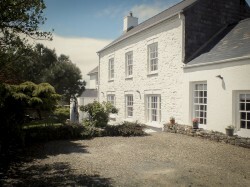 Bank House is also within easy access to the renowned Pembrokeshire Coastal Path. We offer two comfortable double rooms, both en-suite, a separate dining room and off road parking.